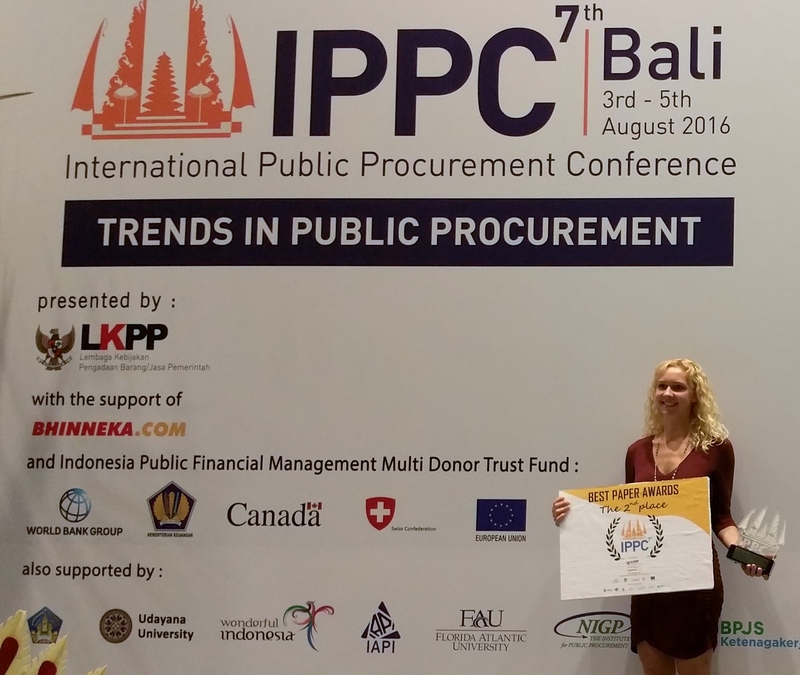 The Seventh International Public Procurement Conference (IPPC) was held August 3-5 in Bali, Indonesia. Hundreds of participants from around the world came to share learnings and best practices on public purchasing. The conference is held biannually, and is the largest international public procurement conference globally dedicated to academic discussion and practitioner engagement. More than 75 presentations were given from practitioners and academia, and findings shared from economic and legal perspectives. Since its inception, IPPC has had a Best Paper Awards Program, sponsored by PrAcademics Press. For IPPC7, 96 accepted papers were peer reviewed by the Scientific Committee, and the top papers selected by a Best Paper Committee. There are three best paper awards, with $3,000 for the first best paper, $2,000 for the second best paper, and $1,000 for the third best paper. Anne Rainville, research fellow and doctoral candidate at the Chair of Innovation Economics, TU Berlin, received the Second Best Paper Award for her paper entitled From Whence the Knowledge Came: Heterogeneity of Innovation Procurement across Europe. The paper presents for the first time an empirical cluster analysis of more than 1500 public agencies across Europe to determine their innovation procurement practices according to existing taxonomies. The article will be published in the Journal of Public Procurement, Volume 16, Issue 4, Winter 2016. Anne’s participation was made possible by funding from the German Academic Exchange Service (DAAD). To induce innovation in the public sector, Directive 2014/24/EU encourages internal and external consultation during the procurement process. However, little is known regarding the prominence of these practices. Determining the extent of knowledge sourcing in innovation procurement across 29 European countries, this paper presents an institutional cluster analysis, examining heterogeneity across knowledge sourcing activities, procurement areas, and tender innovation outcomes for 1,505 public procurers from 2008-2010. Building upon existing taxonomies, three types of procuring agencies are identified: Large collaborative agencies practicing public procurement of innovation (31%); supplier-focused pre-commercial procurers (20%); and direct procurers at the municipal level (49%). Validation supports this heterogeneity, using innovation outcomes and policy drivers. At the country level, Spain and the United Kingdom, Italy, and Germany and Poland are most represented in respective clusters. Findings enable predictions regarding impacts on agencies and innovation from the new public procurement directive’s translation into national law by Member States. The paper will become available shortly at www.ippa.org.